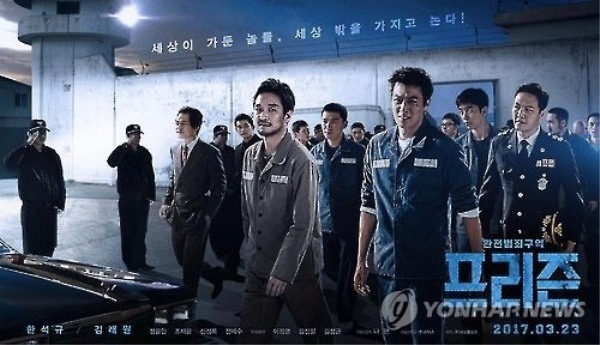 "The Prison," a Korean crime thriller, has already been sold to 62 countries around the world before its release in local theaters next week, its local distributor said Monday. The distribution rights for the movie were sold to such territories as North America, Britain, Australia, New Zealand, Taiwan, China, Japan and the Philippines during the European Film Market at the Berlin International Film Festival in February, according to Showbox. "It was highly rated for being an action genre film depicting the unique theme of the perfect crime committed by prisoners," a Showbox official said. "Since many companies in Europe, Asia and South America have shown interest, the film is also expected to be received well in the Hong Kong film market slated for March 13-16." "The Prison" has been invited to compete in the Brussels International Fantastic Film Festival that runs from April 4-16 and the Far East Film Festival set to run from April 21-29 in Udine, Italy. Starring Han Suk-kyu and Kim Rae-won, "The Prison" tells the story of prisoners who commit crimes in the outside world and return to their cells every night. It is the directorial debut of the veteran screenwriter Na Hyun of "Mokpo, Gangster's Paradise" (2004), "May 18" (2007), "Forever The Moment" (2008) and "South Bound" (2013).